The Tsunami Tsessions documents four guys playing music (and drinking hoppy ales) at the Oregon coast on one weekend. Jim Wilcox had not seen master bassman Jim Spears since the two finished music school in Hollywood, decades earlier. However, the band’s bass player took an out of state gig, so Spears showed up on one rainy February Portland Thursday night to bail out his friend. The two reminisced as they traversed Oregon’s coastal mountains to the small beach house where they would record Tsunami Tsessions. When Stan and Armando arrived, the dining room was a drum pit, the recliner was a guitar amp baffle, and the dining room table was a recording desk. At 8:30 the next morning, Armando counted off, and they started recording The Tsunami Tsessions. Never having met or heard the songs, bassman and drummer came together to craft the low end… and even caused Jim and Stan to re-think long-standing parts. With brief breaks to eat, sleep, and savor the beach on the rare occasions that the sun appeared, the band played until the early hours of Sunday morning… then started again when the sun came up. They band played until it was time to clean up, pack, and get Spears to the airport for the flight back to Pittsburgh. 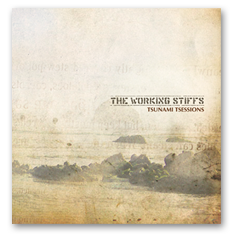 Many of the Tsunami Tsessions recordings are first takes. Most are second-takes. All are genuine, and all reflect four friends having fun recording new music at the beach.